Gavin Bell’s solitary strike settled a close contest as Benington edged out Coningsby 1-0 at a wind-swept Hall Lane. Benington goalkeeper Will Newton had earlier produced two excellent saves to keep his side in contention to claim the victory. Spilsby Town were held at home by Heckington Millers in a match where the home side had to come back from behind to salvage a point. Heckington arrived with a depleted side and could only name a bare 11 outfield players, but found themselves 2-0 up at half time with well taken goals from Sam Elliott and Liam Tunstall. The second half was always going to be an uphill task for the visitors with the wind against them and they weren’t helped when the referee judged a goalmouth scramble to have crossed the line to make it 2-1. The Millers bravely held on until five minute to go when Spilsby equalised. The Spilsby goals came from Conor Minor and Liam Papworth. Swineshead were also held at home by a determined Old Leake side in a match which saw a strong cross-wind causing both sides problems throughout. It was Swineshead who opened the scoring when Richard Barker fastened onto a through ball before calmly despatching the ball into the net to give his side a first half lead. Old Leake deservedly drew level with 15 minutes remaining when they were awarded a free-kick which Adam Tempest sent into the Swineshead box for James Leafe to head home the equaliser. Not content with a point, Old Leake almost snatched victory after going close on a couple of occasions late on. There was another stalemate at Ruskington Rovers, where Pointon returned home with a share of the points following a 2-2 score-line. Ashley Farmer and Sam Jackson grabbed the Ruskington goals. In blustery conditions a depleted Fishtoft side battled hard against Wyberton Reserves but, despite creating some good opportunities, found themselves one down at half time. With Fishtoft pushing for an equaliser Wyberton added a second to run out two goal winners. In the top-of-the-table clash between Leverton and Boston College, it was The College side who took all three points when they recorded their first-ever win over Leverton, and, with it, ended their 38 game and 14 month unbeaten run. In a game of few chances, College took their two opportunities through Nathan Rivett with Nathan Hubbert replying to set up a frantic finish, with the visitors desperately defending to hold on to their lead and secure the three points. Sutterton continue their struggle to get some points on the board as they fell to another heavy defeat away at Old Doningtonians. Three players helped themselves to hat-tricks with Chris Wing, Martin North and Ollie Gedney being the treble-trouncers while Jamie Welsh and Chris Grimer completed the scoring. In a crazy wind-affected affair at AFC Tetford, title hopefuls, Railway Athletic came unstuck in the gales. Leading 4-2 at the break, the visitors’ two-goal advantage proved inadequate as Tetford ran in six second half goals to end up with all three points following a high-scoring 8-6 victory. Nathan Wright did most of the damage for Tetford hitting five of his side’s goals while Jimmy Harris grabbed two. The other home goal came courtesy of an own goal. Railway replied through Nicky Frost (two), Curtis Yeatman (two), Brandon Norman and Jack Carter. Eastern European FC slipped up in the stormy weather when Fishtoft Reserves recorded a 3-2 away win. Radoslaw Kosieradzki and Janis Buzs hit The Eastern European goals. Billinghay Athletic Reserves hit seven in their home match against basement side Mareham United, with Adam Underwood-Harley and Ben Gilbert hitting two goals apiece. Tom Bullimore, Sam Pemberton and Bradley Walker also got on the scoresheet. Swineshead A were also amongst the goals at Sibsey when they recorded a 6-1 away win. Josh Tate grabbed Sibsey’s consolation. Two games were lost due to sides not having sufficient players. Holbeach Bank were persuaded to carry on in The League after attempting to withdraw their Division Two side. They decided, however, not to go ahead with their planned fixture away at Pointon Reserves due to a lack of players. FC Kirton also pulled out of their game at Coningsby Reserves due to similar circumstances. Boston Titans put up a good fight in their home game against Spilsby Town Reserves before ending up empty-handed after a 4-2 defeat. Mike McPhail and Matt Howden hit the Titans’ goals but Town took maximum points with goals from Jay Adams (two), Travis Herberts and Dan Smith. 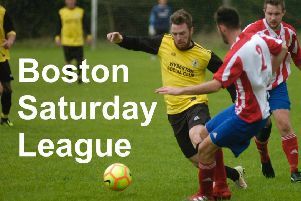 A delayed kick-off didn’t disrupt Benington Reserves’ performance at Boston Athletic as they hit nine goals without reply with Sam Reed, Chris Lawson and Alex Leggatt claiming two goals each. Jason Cade, Dean Stevens and Jordan Histed were also on target for Benington. Old Doningtonians Reserves salvaged a hard earned point at Northgate Olympic with a last minute Brandon Harker header. Harker’s first half penalty had kept his side in the game at the halfway stage with Northgate holding a slender 2-1 interval lead. Luke Barnett headed in The Dons’ equaliser before the Sleaford side looked like taking the three points when they edged in front at 3-2. Old Dons were not finished, however, and Brandon Harker sent his last-gasp header looping into the net to make the final score 3-3. Northgate’s goals came from Dan Broughton’s double and another from Gareth Tomlinson . FC Hammers’ recent good run of form came to an end when they were comfortably beaten 6-2 at home by Friskney Reserves. Jordan Houlston grabbed a hat-trick for the visitors while Joe Smalley, Alex Jacobs and Gino Lanzetta all got on the score-sheet for a well-drilled Friskney side. Aarran Modley was on target with The Hammers’ goals. Spalding Harriers dismal run continued with a 4-1 home defeat at the hands of Pointon Reserves. Scott McPherson hit The Spalding goal. Skegness Town Reserves comfortably booked their place in the next round with a 5-1 home win against Billinghay Athletic Reserves. Josh Whittam, Michael Parnham, Craig Booth, Dan Field and Herbie Nichols hit the match-winning goals.